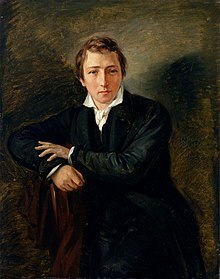 Christian Johann Heinrich Heine (13 December 1797 – 17 Februar 1856) wis a German poet, jurnalist, essayist, an leeterar creetic. He is best kent ootside Germany for his early lyric poetry, which wis set tae muisic in the form o Lieder (airt sangs) bi componers such as Robert Schumann an Franz Schubert. Heine's later verse an prose are distinguished bi thair satirical wit. He is conseedert pairt o the Young Germany muivement. His radical poleetical views led tae mony o his warks bein banned bi German authorities. Heine spent the last 25 years o his life as an expatriate in Paris.